After my radio show on Wednesday, I was inspired to go to DAVIDsTEA on Bank Street to check if they had the Kanpe tea. I didn’t realize it was unveiled last Thursday while being in Montreal for the Arcade Fire free outdoor show for Pop Montreal. DAVIDsTEA and Kanpe Foundation teamed up to contribute the rebuilding of Haiti since the earthquake. The funny thing when I went to the tea shop, I didn’t realize that they were suppose to sell it on Thursday. Luckily, the nice employee was keen enough to let me buy it and not let anyone know about it. 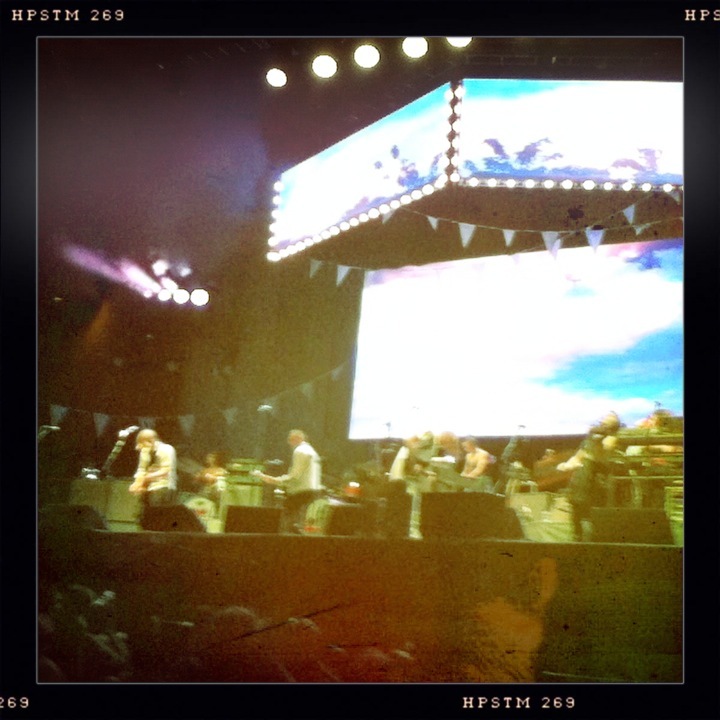 I kind of sweet talked my way about attending the Arcade Fire show in Montreal last week. As seen from the photo above (apology on an object being shown. It’s not the iPad, it’s something else). The 40g gift can and the labelling looks lovely. As for the ingredients, it consists of organic hibiscus, mango, coconut, banana, papaya, cinnamon, stevia and natural flavouring. Onto tasting the tea, it had a tart and tangy taste. I pretty much liked it because it was just flavourful. I never expected a red colour (photo below). It reminded me of previous teas I drank that had a fruity and tangy taste. I just can’t remember what kind. All in all, getting the Kanpe tea was worth it because it goes for a good cause to the Kanpe Foundation and being an avid tea drinker, I go for any kind of flavours. As the website says, it’s to “celebrate Haiti.” I don’t know if the tea is for limited time but just check up them up if they have any available. Last thing, the photos were taken while watching Nat & Marie over from the iPad. This week’s edition is a post Pop Montreal edition. I was suppose to have Lauren join me on the show but she’s under the weather. As much I try not to play a lot of Arcade Fire songs, I couldn’t help my own excitement because of the music festival, which celebrated its 10th year. With the media pass, it was privilege to go to O Patro Vys as they had a good lineup from Friday and Saturday night. There were a lot of choices to go to but I stuck with O Patro Vys because Ohbijou has a new album and the opening acts have a connection to one another. The Evening Hymns and Forest City Lovers are friends with Ohibjou. It was quite a surprise to check out Tasseomancy. They seem to have an influence to Bjork. One thing I forgot was that Tasseomancy are the touring members of Austra. I had a chance to watch the Polaris Music Prize on MuchMusic HD and I didn’t realize they performed at the gala. Saturday night was quite an interesting one, after attending the Pop Vs. Jock charity basketball game, I rushed to O Patro Vys to find out the 8pm performance never happened. Although, I didn’t know Silver Creek, who they performed at around 9pm, are from Ottawa. I noticed several CKCU-FM hosts are supporters of the band. This brings to Gianna Lauren, as I saw her on back to back nights. It was nice to see her perform in Montreal. The funny thing was saving a spot for her parents, who’s a great supporter of her music career. By Divine Right came up next and they totally rocked out. Then, came Allie Hughes as I haven’t seen her in a year. The worse part, I didn’t get a chance to say hi or bye to her. Finally, Sheezer packed O Patro Vys and for any Weezer fans, they didn’t disappoint. Overall, I had a great time in Montreal and I know I wouldn’t stop gushing over Arcade Fire. Kudos to Pop Montreal for the great music festival they organized. It was a fun time. Unfortunately, I did not get a chance to play a track from Evening Hymns, Silver Creek and Sheezer as I was not able to find their albums to provide on the radio show. Don’t forget to listen to the radio show from below. It was a marvelous time at Place des Festivals/Quartier des Spectacles as Arcade Fire performed a free show in Montreal for Pop Montreal. It was an amazing time to be there as the band capped off an incredible year. Just days from winning the 2011 Polaris Music Prize, over a 100,000 crowds packed the place. The opening acts were Kid Koala and Karkwa. I totally forgot about Karkwa opening up for Arcade Fire. Both opening bands were great, Kid Koala played a few classic tracks with his own spin. Moon River was one and it sounded touching. Karkwa rocked out their set and their lead singer did say that they only sing in French as it’s a beautiful language. 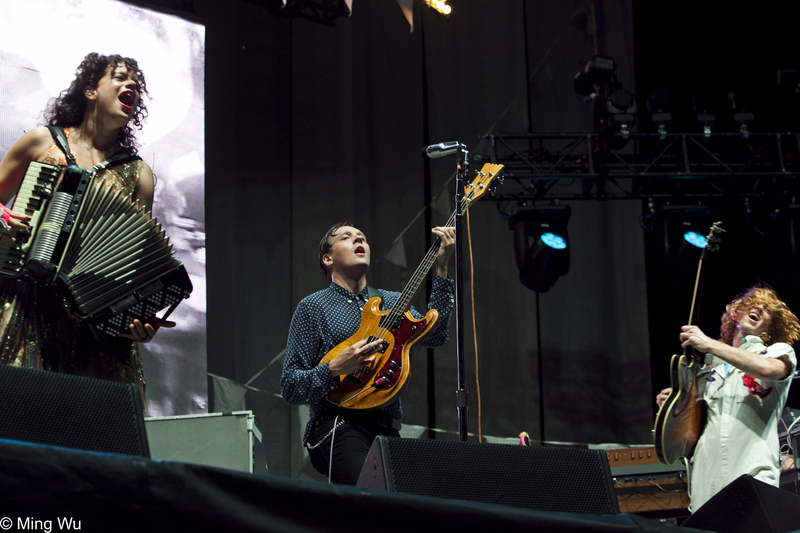 As for Arcade Fire’s performance, it was definitely amazing! I kept singing along to all of the songs. There’s too many to list out as everyone would know all of their song since they’re recognizable. My favourite, Sprawl II (Mountains Beyond Mountains) was the final song and they had giant lighted beach balls bouncing through the crowds. I got bonked in the head several times as the balls kept flying around. It was the best time enjoying all three acts in Montreal. Anyone from Montreal and Quebec should be proud at the band’s accomplishments and the free outdoor show was a way of giving thanks for the support. Even though the attendance crowd is fluctuating from reports, here’s one from review from Spinner. It’s someone that I know of. Who I got to see in Montreal? I did not expect to see The Balconies earlier in the afternoon as I was hanging out at the Notman House. When I headed over to Place des Festivals in the mid-afternoon, I didn’t expect to bump into CBC Radio 3‘s Craig Norris and Steve Pratt. Briefly talked to them about Polaris Music Prize. It was great to see them. 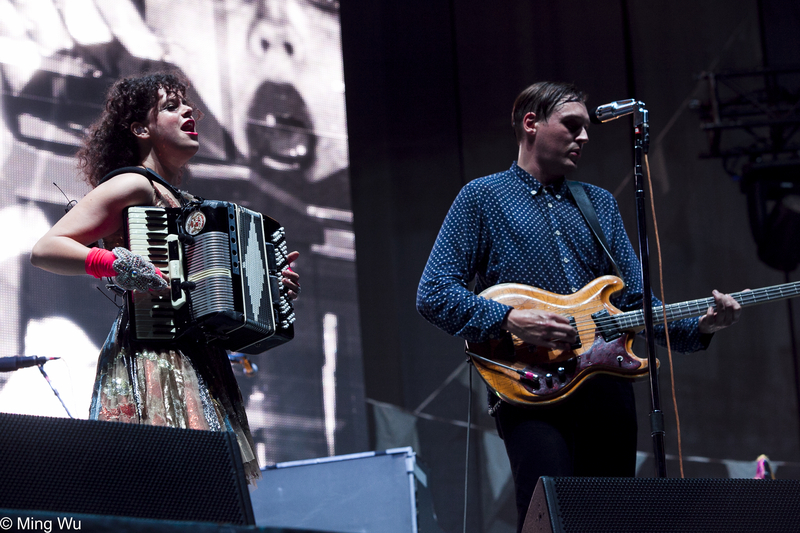 From Storify, some of my tweets from the Arcade Fire outdoor show. Since I couldn’t get a photo to put up this entry. Played a Sally Yeh song called Fall Comes and Fall Goes (秋去秋來). I can’t believe the song is over 20 years now. It’s played towards the end of the September 21st radio show. Due to circumstances, my radio show was live for 2 hours instead of the mix of pretaped and live for the one hour. Joining me for the first half of the show was Lauren and we got to count down the top 10 Canadian indie songs and talk about Arcade Fire winning the 2011 Polaris Music Prize. Also on the show was airing the interviews with Sara Lowes and Said The Whale. They were in Ottawa last Wednesday night. The one with Said The Whale was impromptu because I didn’t think of any questions but Ben Worchester was keen enough to do the interview. I stumbled on a friend’s blog as she wrote about Said The Whale and their documentary. If you listen to my interview, I mentioned about Winning America. The entire documentary can viewed at this link [via CBC Radio3]. The interviews are posted on the audio/podcast section below. The playlist for the September 21st show is at this link. The Wild 10 Countdown entry is at this link.